See who got used by Linden on the Second Life Marketplace advert without Proper Recognition 😳😶! But owner of Z O O M glasses whose photo was used also in this lovely displays posted this on Facebook. Really Linden!, How can you just use a resident like that? His item not even displayed in the Featured items and barely anything on First and Second Page .. Hmm.. Better work on this mess!! Short Video by Shaun Vesace – When the husband comes home early from work and he can smell the Poseball LOL! We need more short and interesting videos in our Second Life, and we just discovered one from Shaun Vesace posted on Facebook and this has been the rave all week. Watch and hope your moods are enlighten. What do you do when your SL Boyfriend has an alt who is engaged and partnered? Jemila posted this on Facebook and it is something to really think about.. Because a lot of these are happening in world LOL. Second Life Residents – Beware !! We got whispered about this particular resident who runs two avatars – sin1969 Resident ( adult avatar) and Shaun Pappilomo (kid avatar) . This is about Real Life and Second Life, and we have informed that we don’t like to get involved in Real Life business, but the whisper seem insistent on spreading the news of the false nature of the residents and to warn others. Read and tell your friends. This has been a hush hush thing for months now. It needs to be spread about him /her. A while back he played a few family members in sl saying his grandmother passed and his RL aunt was taking him to court over his grand mothers money. He had begged and borrowed money from my sl dad 2,000.00 through his paypal credit account and kept coming up with excuses to when he was going to start paying it back. Well tonight we were contacted by his rl aunt who shared with us some very disturbing details about how he has treated his grandmother who is no longer in his he had stolen all of her money, cut her off from her doctors, refused to get the medicines she needed, treated his grandmother like an animal,because of his actions not only is his grandmother alive but unable to communicate due to the strokes she had from being refused medical treatment. People in SL need to be warned of this monster asap. Only a monster treats rl family members like this.. Skip & Dee Official Wedding Invite – Ladies – Give Way!! This Saturday, Skip and Dee becomes Husband and Wife (yuck that kind of sound odd LOL) But it happening. Secret admirers/ Crushes, ladies who are ready to stir somes trouble, sneaking fans, It Over! Skip is out of the Bachelor list.. Look for someone. Congrats to both couple. Someone is so jealous here loll 🙈. Marketplace Gacha Resellers, Creators Vs CopyBotters – GACHA or No GACHA? The heat is on, Creators are getting angrier over the fact that their Gacha items most especially the Rares are been sold on Marketplace by Copybotters for less than the actual price of the item and this has been creating a great deal of dispute between marketplace authentic resellers,creators and residents who buy the stolen items. Alice posted on her Facebook page some few days ago trying to appeal to the public not to buy gacha item from Marketplace but directly from the Designer. Some residents and Resellers are not buying into this as they spend huge amount of money only just trying to get the rare in the case of the residents and the Resellers trying to sell off their huge buys. See more details below or see the link to discussion on Facebook. Not quite sure what the story is with JenniferKatie Dunner but her account is deactivated both on SL and Flickr.She made a new ava – HarlowDarling Resident but a few days ago that also vanished. Second life has brought out a lot of talent and talented people in its years of existence; and it keeps getting better.Flicker has been one of the avenues mostly used to showcase second life and it’s talents; while most of us have been able to get some recognition on flicker; some others have just hugged majority of the recognition. It is often assumed that its a persons popularity that dictates if they get faves on flicker; but most will also argue that it’s talent. Maybe it’s the length of time spent and if that is your argument then Ella Sparks might have rubbished that. Ella Sparkss (Girl friend of Brandon) has been in Flickr since May 2015 and she has favored a whopping 158,069 pictures. While compared with other big names such as Oakley who has been there since April 2010; has more followers and follows more back; has only 47,331 faves. Now the statistics has shown that the length of your stay at Flickers doesn’t dictate how many you would have given the little pink heart to over the time, which then account for Ella’s more than 158k favorites. We are completely discounting the fact that there have been a lot of whispers that her pictures are crap and they haven’t seen anyone have more pictures in their favorites than Ella Sparkss!! … and she’s only been there over a year, her frigging finger must be sore from punching the fave button. Her high faves could also mean she is the best out there on Flicker. We present her the Second Life Ambassador of some sort as most of us have voted for her by faving her pictures and she in turn faves ALL. Haven’t we? Haven’t you? Whatever the case; We say congrats Ella. You may not be as popular yet; but you must be doing something right because Flicker says your Favorite list are booming 😊. Still on the Blogger Manager Payment! We got Whispered about the original link to the earlier post we did on Blogger Managers getting paid and more comments available on Neda post..Here it is. 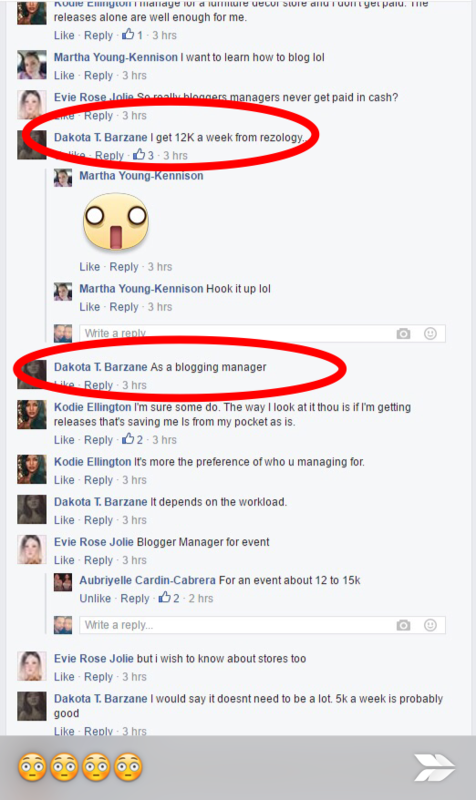 Dakota Barzane – Blogger Manager for NewSea & Rezology mentioned on Facebook that she gets paid 12k weekly as blogger manager for Rezology. 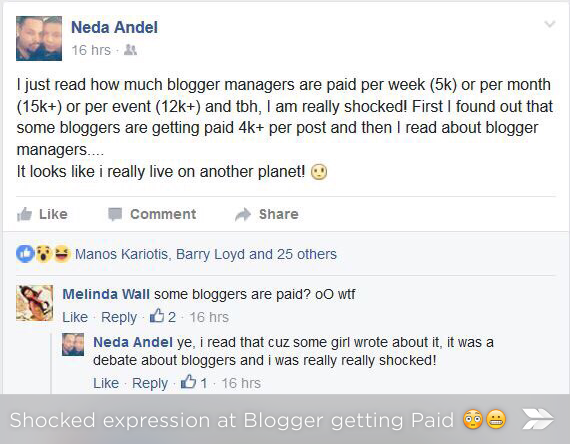 This news came as a huge shock to residents such as Neda Andel who never knew blogger/ blogger manager do get paid and she expressed this on her Facebook page as seen below.